Personalized fine jewelry for little girls and boys. There are many font styles to personalize your engraved gift with. Our sterling silver engraved I.D. Bracelets are a popular gift for all occasions. With a variety of styles and sizes you can be sure to get the perfect engraved bracelet for that special someone. 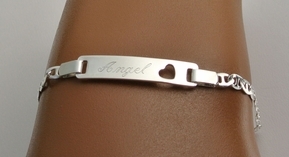 Each personalized bracelet can be engraved on both the front and back. Give an engraved jewelry gift that you're sure will be worn and adored for years to come.